Low cost initial payment and monthly fees which includes breakfast or lunch respectively! Guaranteed place at your chosen group. Your membership allows you to network at all other SBA venues at a discounted cost. Up to 20% reduction on workshop fees. Full page on the SBA website where you can promote your business. Please note where the abbreviation SBA is used in the aforementioned terms this represents the company Strategic Business Alliance Ltd. The definition ‘home’ venue is the member’s chosen venue where they have elected to network and transact business and go fortnightly throughout the year of their membership. SBA is a networking organisation open to all businesses, trades and professions. We do not operate an exclusivity policy. However, we do try to have no more than two companies in the same field or business sector at a home venue excluding visiting members or visitors. Membership gives you access to your chosen home fortnightly venue. Types of membership are listed in items 3 and 4). Plus you have your own full page on the SBA website. A breakfast venue (Bronze Example) there is a monthly meeting fee of £45.00. will be payable to SB alliance for your home venue by standing order, in addition you can attend any other SBA venues as a ‘Visiting Member at the advertised Member’s rate. Details of which are listed in our events section. As a visiting member you will currently be able to book by email and pay cash/card fee which is payable on entry, this covers the meeting/venue costs. Each breakfast venue will consist of up to 22 permanent home venue members and/or 10 visiting members or visitors. 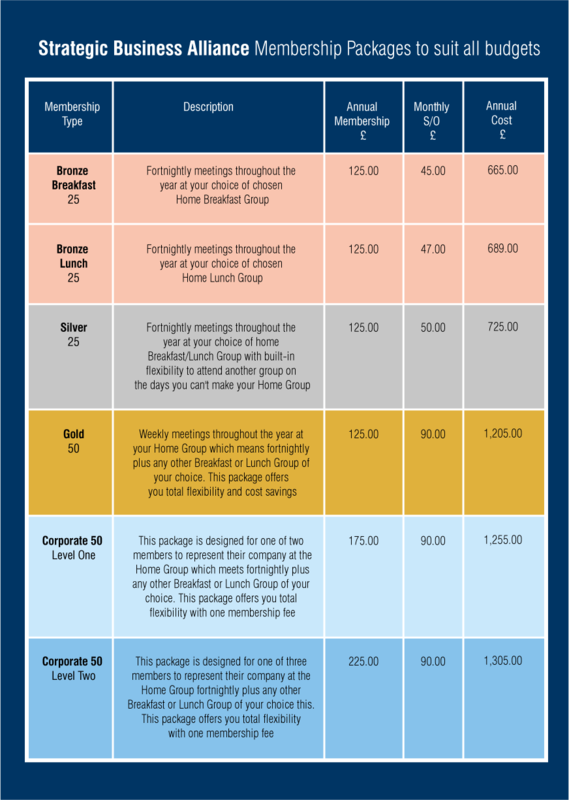 A lunch venue (Bronze Example) a monthly meeting fee of £47.00 will be payable to SB alliance for your home venue by standing order which includes your home venue, in addition you can attend any other SBA venues as a ‘Visiting Member' at the member’s rate as advertised. Details of which are listed in our events section. As a visiting member you will currently be able to book by email and pay cash/card payable on entry, this covers the meeting/venue costs. Each lunch venue will consist of up to 12 permanent home venue members and/or 6 visiting members or visitors. Attendance at a meeting as an SBA member you can be substituted by another person from the same organisation or not. If you wish to transfer your home venue to an alternative group this is possible after serving three months subject to a transfer administration fee of £30.00 payable for the change. Only one change is allowed during your year of membership also if required a different person in the same organisation can be carried out, subject to a £30.00 administration fee. You will be invited to renew your SBA membership prior to its expiry we will email you or phone you at least thirty days prior to your expiry date. The preferred method of payment is by Standing Order. or BACS full details will be supplied on taking up your membership. To keep costs to a minimum and to offer an efficient SBA membership renewal service, we provide a ‘continuous membership’ programme. This means that once you have chosen to renew your membership for the first time following your first year’s membership period, you then become part of the SBA renewal programme. All membership renewals are transacted by standing order or BACS and become continuous membership renewals. Annual membership: If you have paid £125.00 for twelve months membership, the same debit/credit card will be charged at £125.00 for the year. An email will be sent to the email address associated with your membership at least thirty days reminding you that this is coming up for renewal. This is ten days ahead of the thirty day notice period required for cancellation (see membership cancellation section below in clause(s) 1, 2 and 3). Founder Membership: From time to time and at the discretion of the management of SBA will offer a certain number of promotional memberships at £95.00 as the annual membership subscription for one year only and this reverts to the normal annual membership currently £125.00 These are normally offered at the launch of a new SBA group for a limited period only. All other monthly fees and terms apply as a normal membership except the discounted membership fee. The annual membership, of twelve months no cancellation or refund is possible once payment has been processed. For SBA Continuous Membership, at least thirty days’ notice is required in writing to cancel your membership. This notice period is the thirty days prior to the expiry date of the current term of your continuous membership. Notice must be given by email to info@sballiance.co.uk. SBA will automatically acknowledge your cancellation email by a return email. If you do not receive this email and cannot provide it to us on request, your cancellation will not be valid. If you wish to cancel your membership after the thirty days’ notice period has expired or immediately after a continuous membership payment has been taken, you will be charged an administration fee of £50.00. Any refund due will be paid no later than ten days after the refund has been requested. The refund will be the membership fee that was paid less the £50.00 administration fee. SBA may at any time without notice and for any reason deny you access to the Website or to any aspect of the networking Service. You agree that we may delete, edit, lock move or remove any content without notice and for any reason and/or to record the IP address from which any content is posted, uploaded or displayed without notice and for any reason, (including, without limitation) content which is in breach of these terms. You shall not be entitled to a refund of any amount corresponding to the unexpired portion of your membership if your access to the Website and/or the networking service is restricted, suspended or terminated. Use of the website and the networking service is at your own risk. Both are provided on an "as is" basis. You are solely responsible for how you interact with other users of the website and the networking service. the conduct of any user of the website. any technical or other failure of the website. your attendance at events and meetings with other users of the website and the networking service. SBA does not provide any warranty as to the fitness or otherwise of the venue nor the owner and/or operator of the venue at which SBA meetings take place. any dealings that you have with any users of the website and/or the networking service. any subsequent arrangements, contracts, agreements or business relationships that you enter into with any person (whether a Member or otherwise) as a result of or facilitated by your use of the website or the networking service. If SBA is found to be liable to you directly or indirectly in relation to the website or the networking service that liability shall be limited only to the membership fee. Nothing in these terms shall limit liability for death or personal injury caused by negligence. You agree to indemnify us in full and on demand against any loss, damage, costs or expenses which we suffer or incur directly or indirectly as a result of your use of the website and the networking We reserve the right to update these terms from time to time at our discretion. Amended terms shall become effective as soon as they are placed upon the SBA website and your continued use of the website and the networking service constitutes acceptance by you of the updated terms.